You are at:Home»Managing Health Conditions at Disney»What Are “Disney Featured Providers” for Scooter, Wheelchair & Stroller Rentals? And do I need to use one of them? For wheelchairs/scooter and stroller rental, Disney has given a coveted title to a small number of companies. These companies can call themselves “Disney Featured Providers”. I tend to call them Disney’s approved vendors because it’s just easier to understand. What’s the difference between these companies and those that don’t have that title? And do you need to hire one of them? Or can you choose one that’s not a Disney Featured Provider? First, which companies are considered Disney Featured Providers? You can see contact and website information on those companies here in this article: Should I Rent a Wheelchair or ECV/Scooter From a Non-Disney Outside Company? And How to do it! 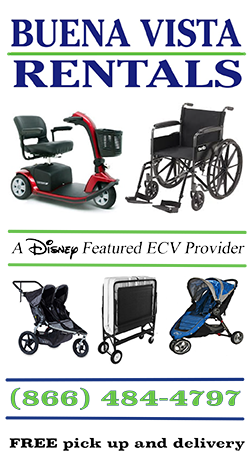 You can see contact and website information on those companies here in this article: Strollers at Disney World – All you need to know. What’s the difference between Disney’s Featured Providers and those that are not? 1. The Disney Featured Providers have gone through intense vetting & must continually maintain high standards. In a nutshell, the companies are pre-vetted for things like quality, service, excellent communication, technical competence, on-time delivery, etc. Disney has set high standards for Featured Providers, which the companies must meet and sustain. Here’s Disney’s page that discusses the standards they set for these companies. What does that process look like? “There is a huge vetting process… A company can’t just choose to be a preferred vendor. First they must be asked to submit a bid, then go through the vetting and business review. Disney does walk-thru’s of our facilities… then Disney chooses who they want to work with. …and when chosen, they do annual reviews. That’s quite a lot of responsibility for these companies, but Disney always maintains high standards as a business, and they expect that of their Featured Providers. 2. Disney’s Featured Providers have privileges, which means convenience for customers. The Disney approved companies have certain privileges that the non-approved or non-featured Providers don’t have. For example, Featured Provider companies can go “backstage” at Disney World. So if your scooter, wheelchair or stroller should breakdown in a park, the Disney approved companies can bring a replacement into the park wherever you are, and they can get there much faster than the non-Disney approved companies because they can use Disney’s backstage areas. Some non-Disney Featured Provider companies get in the parks using annual passes. They must go into the regular parking lot with all the other Disney World park guests. They must park their cars, make their way to the front of the park, wait in line to go through security, wait in line to give their finger prints in a scanner to enter the park, and then they must go through the park to get to you. That’s much more time consuming, and you’ll most likely be waiting for them longer than you would a Disney Featured Provider. We do hear that some companies can not get into the parks at all, and require their customers to wheel their scooters outside the parks, even if they’re dead. Frankly we wouldn’t recommend using a company that requires this. It’s an important question to ask a company before hiring any non-Disney Featured Provider. Also another advantage of the Disney Featured Providers is that they can drop off and pick up your scooter/wheelchair or stroller at your Disney resort without you being there. They’ll leave it at Bell Services so you have it when you arrive at your resort, and when you leave, you can drop it off at Bell Services. Non-approved vendors must make an appointment to meet you to give it to you and to take it back. You’ll need to be in a certain place at a certain time. That’s a huge difference of convenience. Are there advantages to non-Disney Scooter/wheelchair/stroller rental companies? There are some great companies that are not on Disney’s Featured Provider list. It’s a personal choice whether to go with one of them. Personally in most situations we recommend choosing a Disney Featured Provider because of the pre-vetting by Disney, the high standards they must maintain, and the huge convenience factor. In order to compete with the Disney Featured Providers, some of them will throw in some free stuff, which might be appealing for those not concerned with the convenience factor or pre-vetting. There are non-Disney approved companies who offer handicapped strollers that may not be offered elsewhere. There’s one scooter company (Randy’s mobility) that we know of which has been willing to rent to those under 18 if they deem them competent to handle the scooter. They will train them to use the scooter as well. There are some stroller companies that offer a wide variety of child care products for rent or purchase as well as the stroller rentals. For example, A Baby’s Best Friend. We have heard that one non-Disney approved company in particular tells potential customers that the Disney Featured Provider title is just a “paid for” title, and that they would rather keep prices lower than pay Disney for the privilege. As you can see from everything above, that’s not at all the case. There’s a lot that goes into becoming a Disney Featured Provider, and ultimately it’s an invitation only title with a lot of obligations and responsibilities attached to it, as well as perks for customers. Who do we recommend for scooter/wheelchair or stroller rentals? We did a lot of research, and our first choice for scooter/wheelchair and stroller rentals was Buena Vista Rentals. We invited them to sponsor us, and we were so happy that they came on-board. Stroller Code: If you’re renting a stroller, use the code “Easy Disney” to get a free snack tray. Wheelchair/Scooter Code: If you’re renting a scooter or wheelchair, use the code “Dizabled” to get either a free rear basket (scooters only), or a cane or cup holder. For more information on using scooters or wheelchairs at Disney, check out are article series here. 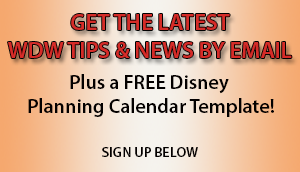 For more information on strollers at Disney World, check out this article. FREE SCOOTER ACCESSORY FOR OUR READERS! CHOOSE A FREE CUP HOLDER OR CANE HOLDER with scooter rental. MENTION THE CODE "DIZABLED". Click here to see this discount offer on their website.